Are you sure Namma yoga is closed down? 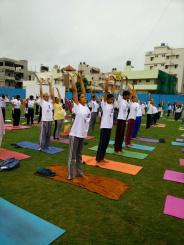 The best yoga training institute with good faculty who are trying to serve the soceity is namma yoga. Daily morning yoga from 5 to 6 am, with lot of new posture daily. Best yoga training from Jayanath. These guys take very nominal fees for infrastructure maintenance. Mr jayanth has a very good knowledge of Yoga, he knows the advantages and correct procedure of each asana. The best Yoga centre in Banashankari. 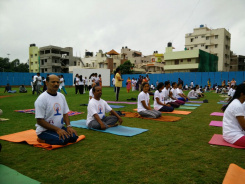 Mr jayanth teaches yoga professionally & with lot of patience. Mr Gupta & Jayath started this institute to teach people yoga & they not to earn money & make profit. 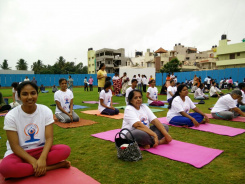 Though i am not regular to classes, but i love Namma yoga & will recommend this to others. Currently the classes are held in ground floor, and it becomes hot in summer, it would be better if the class is shifted to first floor. It is very good and all staffs are friendly. Yoga center is good.well training is given by trainers. God opinion about yoga center..it is useful.